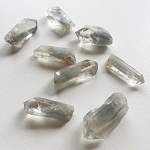 Natural mineral specimens and crystals are found in the environment in their natural state and collected off the surface of the ground or are obtained through physical digging and mining. Natural crystals and specimens are not cut or polished. Beautiful translucent light smoky brown colored Natural Smoky Quartz Crystals from Brazil. Very interesting vitreous, rare, light green prismatic, tabular Epidote crystal clusters with a "frosting" of quartz crystals on matrix from Kimberley, South Africa. Exotic and interesting Natural Smoky Quartz Crystal Cluster on Matrix from Malawi, Africa. Beautiful clear Quartz Crystal Points with foamy sea green colored phantom mineral inclusions from Mwinilunga, North West Province, Zambia, Africa.